Would you like to link to our Freshwater Fishing website? Cool. We have made it easy for you to do so. Simply copy and paste any of the following codes into your website or blog. It should NOT look like the plain text you see in the box when on your website. If you would like to include a few details explaining what our freshwater fishing website is about, then please feel free to do so. Or, you can simply copy and paste the information from the box below. <a href="https://www.fishingloft.com">Freshwater Fishing at FishingLoft.com</a> Freshwater fishing tips and techniques to help you catch more fish, fishing photos, various methods for cooking your catch, and free fish recipes. Rather have a smaller version? If you need help with any of this, use the form on our contact page. We will be happy to assist you in the process. Would you like a reciprocal link back? Use our contact us form and let us know. Be sure to leave the URL of your website and provide a short description of what your website is about. We'll check out your site, and if it's relevant to ours, and meets our criteria, then we may proceed from there. We have some specific requirements for exchanging links. Your website must be either about freshwater fishing, cooking fish, fish recipes, or fishing related, i.e., fishing tackle or product reviews. The website should be in working condition - no broken links or under construction pages. No link farms or other shady practices. No racist, sexist, or cruel and demeaning sites will be considered. Must contain quality content, not just a store front. Furthermore, I would much rather exchange links to be posted within the content on one of each others' web pages, rather than throwing the links on a page full of fishing links. Why? It carries more weight with SEO, and the search engines are beginning to crack down on those link pages, thus penalizing those websites. Yet, there does seem to be exceptions. Since you are reading this here, you must already know how important and valuable having good high quality links pointing to your website can be. I would like to offer you a FREE book called "Make Your Links WORK!" It can be yours by going here to the Value Exchange. While you're there, take a moment to sign up for the link exchange program. 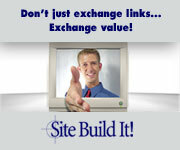 You'll be able to find other websites that are willing to exchange links. But not just any websites, high quality sites related to your niche. It's simple, fast, efficient, and real! And it's all FREE! This is just one of the many powerful resources that Solo Build It! offers. Non SBIer's only have limited benefits of the programs in Value Exchange. As a SBIer, you gain access to so much more additional automation and management tools to help create successful websites. If this sounds interesting to you, consider becoming an SBIer yourself.